Manufacturer of a wide range of products which include material handling systems, bulk bag dischargers and bulk bag fillers. 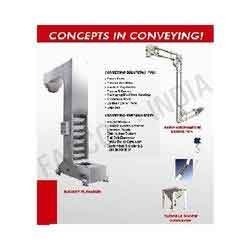 We are a distinguished name engaged in offering Material Handling Systems to the clients. Our offered system is precisely engineered by employing sophisticated technology under the supervision of expert engineers. Moreover, this entire range is available with us in various specifications and widely used in pulses, rice, seeds, sugar, salt, chemical in granule, powder and solid forms. We are a famous name engaged in offering Bulk Bag Dischargers to the clients. Our offered product is designed and developed with precision and high-end technology at our manufacturing unit. The offered product is strictly checked on various parameters to ensure its quality and functionality. Moreover, clients can avail this entire range from us in various specifications as per their specific requirements. To cater to the ever-changing demands of our clients, we are engaged in offering Bulk Bag Fillers. Our offered product is manufactured using top-notch quality materials coupled with most recent technology in adherence to the set industry standards. Moreover, to ensure its quality and durability, it is comprehensively checked by our expert quality controllers.